The SleepWeaver 3D is the first mask to the feature the new white, elasticated cushion that enables it to better adjust and grip to the skin. This allows it to fit more patients, and with a more reliable seal. In fact, such is the flexibility afforded by the new elasticated fabric that the SleepWeaver mask only comes in one size, as it can adapt to almost any facial size. There are two headgear sizes; The medium size is for neck sizes up to 16.5", and the large is for neck size over 16". Since the SleepWeaver Advance launched in 2010, the soft-cloth mask design pioneered by Circadiance has transformed CPAP therapy for hundreds of thousands of CPAP patients. By replacing the traditional silicone contact material (and even gel masks have a top layer of silicone) with fabric, SleepWeaver masks greatly improve comfort and reduce skin irritation. In addition to this, the flexibility provided by fabric allowed for greater freedom of movement. In fact, such is the flexibility afforded by the new elasticated fabric that the SleepWeaver mask only comes in one size, as it can adapt to almost any facial size. Committing to a new mask can be a risky business; nobody wants to risk spending money on something that may not work for them - particularly if that mask is a radical departure from what they are used to. However, we are so confident that you will love the SleepWeaver 3D that we will provide a refund if you return it within a month. All we ask is that you watch the instructional videos provided below, give yourself a few nights to adjust to the new mask, and if you are one of the few that cannot get it working for you after that then let us know and we can arrange the return and refund. 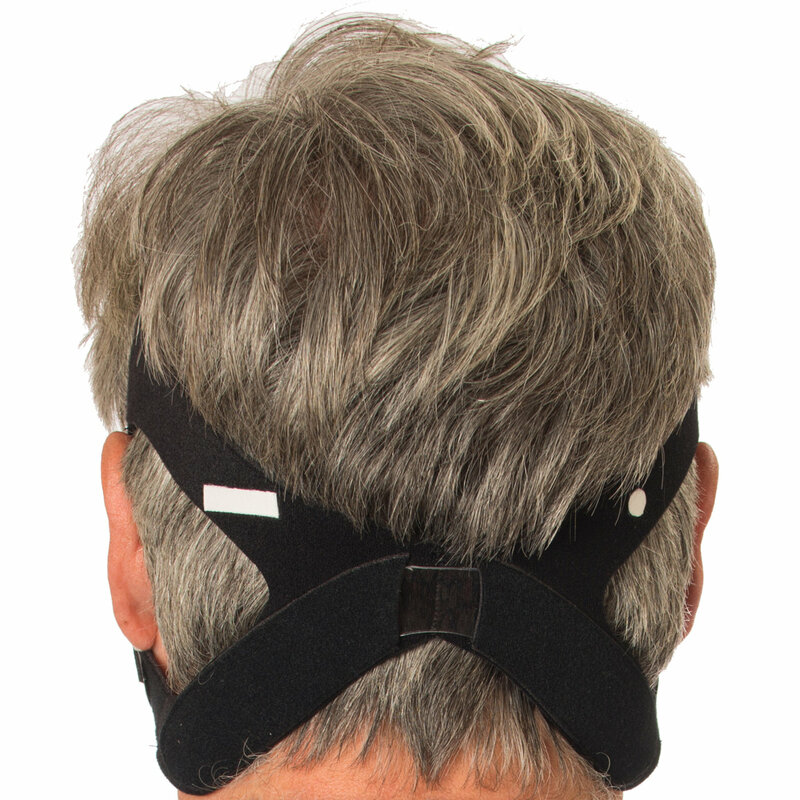 A new wing-shaped stay routes the headgear under the ears, promoting comfort and a great fit. Permanent 360° swivel that provides reliable performance in any position, including over the headboard. Breathable cloth design that prevents fogging that is common in hard plastic masks. Nothing breathes like cloth keeping skin dry and comfortable. For those who want to read or watch TV while in bed, SleepWeaver 3D allows users to wear glasses with the mask on. Almost everyone prefers having soft cloth against their face as opposed to rubber, silicone and other gels. Cloth masks eliminate the need for a cushion or nasal pad. Is the SleepWeaver 3D a specialty mask? The SleepWeaver 3D Nasal Mask is intended to provide an interface for noninvasive Positive Airway Pressure (PAP) ventilation therapy. This mask is intended for single-patient use in the home and single-patient use in the hospital / institutional environment. This mask is to be used on individuals who are greater than 66 lbs (30 kg). Does the SleepWeaver 3D Mask come in different sizes? The soft cloth portion of the mask is only available in one size and the headgear is available in regular and large. The most accurate measurement is directly under the jawline. If you measure 16 inches (41cm) or above, then you should consider the large size headgear. If you measure 16.5 inches (42 cm) or less, then you should consider the regular size headgear. The SleepWeaver 3D is intended to be used on individuals who are greater than 66 lbs (30 kg). What should I do if I am experiencing leaks with my SleepWeaver 3D? You should make sure your measurements are accurate. If your measurement falls between the two headgear sizes, then you should try each size headgear to see which one provides the best fit. You can also review the fit tip video online at https://circadiance.com/3dvideos/. Does the mask come in different colours? No. The SleepWeaver 3D is available only in blue. The cloth is the same material used to make winter ski clothing. A portion of the mask that contacts the skin contains polyester, nylon, and elastane. The cloth material is “breathable” meaning that the material wicks moisture and heat away from the user’s skin. The headgear consists of polyurethane foam, nylon, and lycra. Yes. Circadiance warrants that your SleepWeaver 3D Soft Cloth Nasal Pap mask and headgear shall be free from defects in material and workmanship for a period of ninety (90) days from the date of purchase by the initial consumer. If you, the patient, purchased one of our SleepWeaver products (SleepWeaver Advance, SleepWeaver Advance Small, SleepWeaver Advance Pediatric, SleepWeaver Anew, SleepWeaver 3D or SleepWeaver Élan) through your Home Care Provider or an Internet Reseller and do not like the product, you can return it to the location where it was purchased within 30 days of initial fitting or 30 days of receiving the product. Can I replace the swivel on SleepWeaver 3D? The swivel is permanently attached to the mask and cannot be replaced. How long will it take to become comfortable with the SleepWeaver 3D? Most users report that after the first night using our SleepWeaver product, it is the most comfortable mask they have ever tried! However, it can sometimes take longer than one night to become accustomed to new equipment, especially if you are new to CPAP and sleep therapy. Follow the instructions provided by your medical equipment supplier. We also encourage you to view the SleepWeaver 3D videos, read the instructions and call us for support if necessary (888-825-9640). Once you are comfortable with your new SleepWeaver 3D Mask, you too will experience the restful sleep you have been missing. With SleepWeaver 3D, it is recommended you place the hose down towards the user’s chest, or off to either side. If you wish to direct the tubing over their head, i.e. behind the headboard of the bed, ensure that a sufficient length of tube is available so that no major kinks are in the tubing. Some PAP users connect 2 lengths of tubing to provide a longer hose which allows greater freedom of movement. Circadiance also sells the following accessories to assist in positioning the hose to your preference; Feather Weight Tub, Tether Straps, and Hose Clips. Will SleepWeaver 3D work with my existing CPAP or Bi-Level machine? SleepWeaver products are designed to work with all standard CPAP and Bi-level machines. The fitting on the SleepWeaver 3D fits the 22mm ISO standard port which is used on most PAP Machines. Can I use the SleepWeaver with a humidifier? Yes. The mask can be used with machines that have that option. Refer to your machine’s user manual for more information. How long will SleepWeaver 3D last? SleepWeaver 3D is warranted for 90 days. Many of our users report wearing it for a longer period of time. How do I clean the SleepWeaver 3D Mask? The SleepWeaver 3D should be cleaned by hand washing with a mild, nonabrasive soap in warm water every other day. Never use hot water. Repeat washing until visibly clean. Hand wash the headgear weekly. Rinse well with quality drinking water and allow to air dry out of direct sunlight. Does the plastic stay need to be removed from the headgear for cleaning? Does SleepWeaver 3D have an exhalation valve? The exhalation “valve” on the SleepWeaver 3D is a series of very small holes that gently and quietly exhaust the exhaled air from the mask. These holes provide quiet operation without creating a jet of air that make a lot of noise. The leak rate provided by the exhalation holes is comparable to competitive CPAP masks. As long as the mask is properly maintained and washed, the exhalation valve will provide consistent exhaust performance. Can I sleep on my stomach while wearing the SleepWeaver 3D? There is nothing in the field of view so users can read or watch TV and even wear eyeglasses with the mask on. Can I travel with SleepWeaver 3D? Yes. The SleepWeaver (3D, Advance, Élan, Anew and Advance Pediatric) product lines are the smallest and lightest masks for travel available. They fold into a very small size when not inflated so they will fit easily into any carrying case you would use for travelling. Is this SleepWeaver 3D Mask FDA cleared? No. We are currently awaiting FDA clearance for this product. Can I use the SleepWeaver 3D Mask with a broken nose or deviated septum? We have had a number of users with anatomic issues around the nose report using the SleepWeaver with success. The pliable nature of the SleepWeaver soft cloth CPAP masks allows it to conform to the user’s facial anatomy even if it is not symmetrical. Does the SleepWeaver 3D address the problems of people who have skin reactions to plastic masks? The SleepWeaver 3D is designed to be gentle on the skin. We have had a number of user’s report that their skin irritation problems disappeared after switching to a SleepWeaver. What is the recommended pressure? We have tested SleepWeaver 3D at pressures from 4 cm H2O up to 20 cm H2O on CPAP and Bi-Level systems.